The North-Eastern Peloponnese is the ideal place to start exploring the peninsula. Full of beautiful towns, glorious history, and archaeological sites, Corinthia and Argolis are the perfect places for an introduction to Peloponnese. Day first and it is essential to wake up early in the morning and after having a tasty and full breakfast take a deep breath of the morning breeze that smells trees, flowers and the saltiness of the water that is so close everywhere you turn. 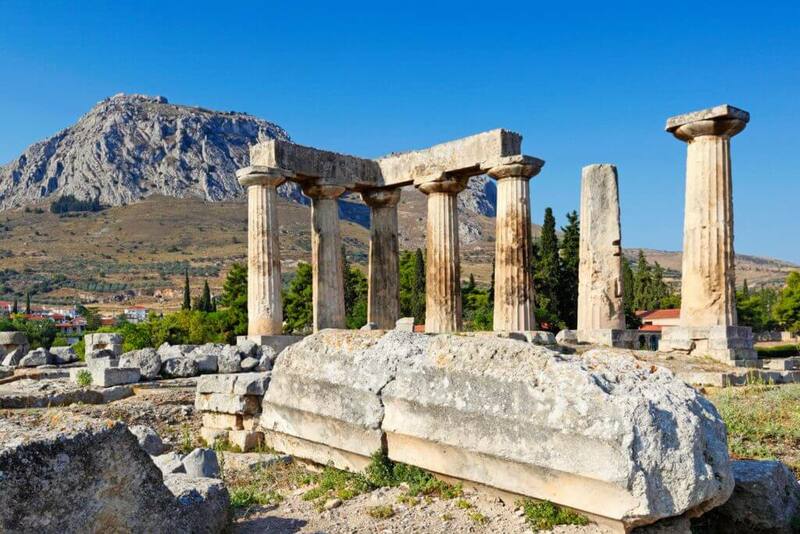 Corinthia, like the most of the regions in Greece, has its own history for you to learn with a visit to the Acrocorinth castle and the monuments near it in ancient Corinth town. Built in possibly 7th-6th century BC in a cliff so high that you can have an amazing view of the sea and the fields below, the castle has its stories to tell and its mysteries to hide as always happens in such places with a long, heavy past. If you are feeling energetic and fearless you can try bungee jumping to the Corinthian Canal with a little help from the experts of Zulu Bungy well known for their professionalism and the many years of experience in the area and this specific extreme sport. Open for the summer season from April until October. Or….depending on the weather and time of the year, you can allow yourself try something a bit less fearful and down to earth with a visit to the Waterfun Park in Corinth nearby. Large pools and long water slides, many funny toys and activities for you and your children and a coffee shop where you can take a small rest and continue the fun. For the wine lovers the whole region and the area of Nemea – where Hercules by one of his labors killed an enormous lion that had spread terror to the passengers and wore its skin as a trophy for his achievement – has plenty of wineries, vineyards, and estates. There, upon request, you can book a wine tour or wine tasting and try some really remarkable varieties of red wine from grapes that grown only in the area of Nemea, still unknown to the majority of people. Such estates are the Palivou Estate, an old farm with a long tradition of making good wine, and the Estate Constantin Gofas that passes the philosophy of winemaking from generation to generation and exports several of its labels. It will be already noon by now and in order to quench your hunger, you have fortunately many options since Peloponnese is famous for the homemade delicious food and the fresh ingredients of its land and the local producers. The climate here is ideal to allow the growth of fresh vegetables and fruits all year around. Oranges and tangerines, tomatoes and lettuces, cucumbers, cherries and so many others are the high-quality products of the area. Have a sit in Danaos and Anastasis Grill restaurant in Nemea area and enjoy really well cooked, homemade dishes in a cozy environment. A traditional tavern with local meat and wine. Also, you can choose if you are closer to Argos city and prefer something fresh and excellent Aigli is a restaurant with Mediterranean cuisine and fine dishes. It is about time to choose your accommodation so you have to choose a hotel or a hostel to spend one of the two nights, that is the minimum stay needed so you can have an interesting, enjoyable trip. A very nice suggestion for accommodation is the Nafplia Palace Hotel & Villas one of the Peloponnese hotels that are right above the beach, facing the sea and the Argolic Gulf. Warm hospitality and nice location along with the view of the sea will make you feel like home tasting the amazing delicacies of the hotel and relaxing after a long driving day touring around. Alternatively, you may choose to stay in the heart of Argolis and close to Nafplio, at the forest of the area in the Opora Country Living. A farm within an area of about 30 acres with safe infrastructure, in a unique location with the incomparable beauty and tranquility of the countryside, mixing the traditional with the modern and the luxury with simplicity. In the afternoon there is nothing better that a trip in Nafplio town. The old capital of Greece looks amazing in every season and leaves only good memories and strong images to each visitor. The sea-fortress Bourtzi is an old castle in the sea that is reachable only by small boats all day long that is used as a museum nowadays. Lastly, if there is still sunlight outside so you can enjoy the breathtaking view, you can climb up to Palamidi hill with the castle under the same name, following the 99 steps and make small stops to catch your breath and take a look at the view and the town from above. Once used as a prison, this place with the heavy past and the huge importance for the Greek nation, now stands proudly, welcoming the thousands of visitors each year, showing off its beauty that remains unspoiled even after so many decades. To close a long day of exploring the NorthEastern Peloponnese, have dinner in a traditional tavern in downtown Nafplio like the locals do every evening and relax having the still fresh memories of the history you learned and the pictures that are keep coming in front of your very eyes. Byzantio is a classic tavern in Nafplio, a typical choice among Peloponnese Restaurants, where locals gather for original tastes and meze style food, which they accompany with good Peloponnesian wine and ouzo for long, lazy nights. For a more modern style food choice, there is the 3sixty restaurant, a wine bar-cafe-restaurant with fusion cuisine and exotic tastes to try something different and extraordinaire. 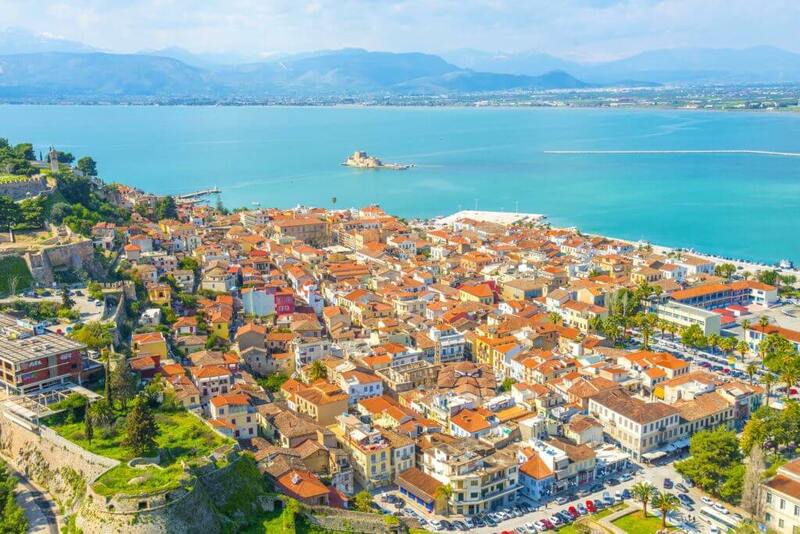 On the second day and an hour or so away from Nafplio, there is another ancient city that has met glory in its times. Mycenae was created by a people of both warriors and people of the arts. A great town of wealth and power knowing only victories and bringing back countless trophies from any battle was taking place back then. Firstly, visit The Archaeological Museum of Mycenae to see and learn more about this glorious, ancient civilization and then go up on the hill to pass under the Lion Gates and enter the ruins of this marvelous town. 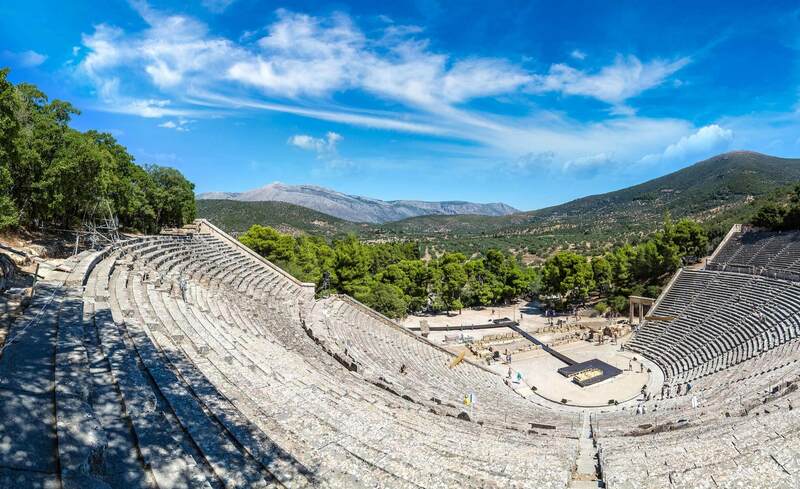 To continue, you will probably need to spend many hours on a trip to the Ancient Epidaurus Theater and the area around it. The worldwide famous theater is the place where the ancient Greeks put on their theatrical plays whereas were tragedies or comedies. A place of great importance to world’s culture and a huge heritage for the whole world. If there is a play scheduled during the days of your visit, don’t miss the chance to experience watching it. Visit The Museum of Epidaurus and have the opportunity to know more about the Ancient Greeks and their ways to create sculptures, pottery, and so many other wonders. For Greeks, religion is a huge matter and that is why every city or village has a large number of churches and monasteries. If you would like to know more about the Orthodox church and the customs related to the Greek Orthodox Religion there is nothing better than to visit a monastery or a byzantine old church. The Monastery of St. Anargyroi is a sample of a Byzantine monastic architecture and famous for its springs with thermal waters, is built on the ruins of the temple of Asklepios between 9th and 11th century. Located near Ermioni, a seaside village known for the great seafood and the clear beaches, in the monastery there is a library of great importance, “Karamaneios Library”, which bears the name of its founder, Hydra Metropolitan Prokopios Karamanou and is a single gem. It includes rare and old versions of classical, Byzantine and ecclesiastical writers, plenty of old magazines and many foreign books. It will be noon before you even realize it and you will feel the need to regain your powers to continue your wandering around. The Hippocampus restaurant is and excellent choice in Porto Cheli town where you can taste remarkable seafood from the area and delicious meze style dishes. Later, in the afternoon, if you follow the seaside street from Ermioni back to Nafplio you will discover some amazing beaches and small villages by the sea, that in winter time seems like they are in hibernation mode but in the summer time, they are full of life. One is Vivari with its wonderful taverns literally on the sea and the quietness to dominate the place. The freshest seafood on your plate and the kind and polite people ready to help you and suggest you anything you may need. 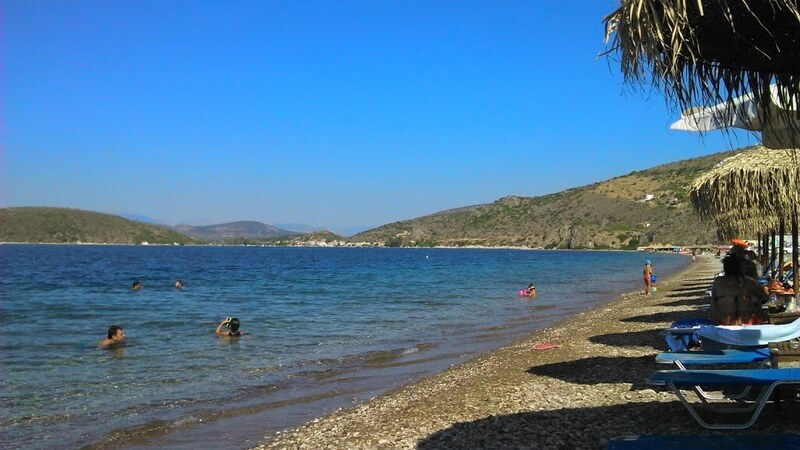 Kondyli beach, next to Vivari, is a great beach to swim before your meal. 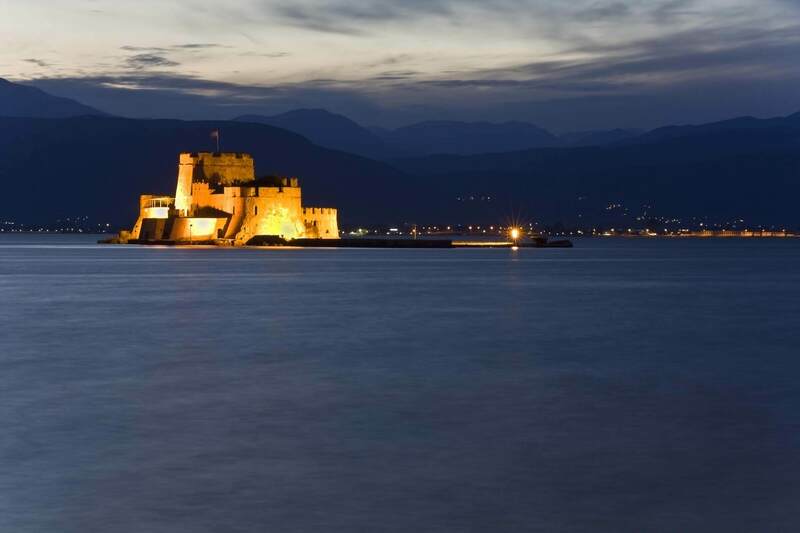 You can make a “close up” walk in the evening in Nafplio town, which becomes quite vibrant during the evening. Have a drink or a cocktail and get to know the locals. They have always a story to tell you and something new to reveal so you wish you could stay a little longer. San Rocco is a nice wine bar for drinks and Greek cuisine otherwise, you can visit La Gratella with good wine and Italian food. Give a little bit of time to yourself to remember all the new things that you have learned, gained and experienced through this journey that may last only two days but will be vivid in your mind with strong images, mesmerizing smells, and feelings of all kind.